This product is the solution that problem of the Telco Demark in the wrong place or even the wrong building. the 2346 DS3 Fiber Optic modems will let you extend out to 100KM. The EdgeAccess® Canoga Perkins 2345 Fiber modem is an SNMP managed multi-featured fiber optic modem that optically extends standard T3/DS3 (44.736Mbps) over single mode or multimode fiber optic cable. It is designed to enable Service Providers, Carriers, Government, Military and Corporate Enterprise to expand the capabilities of their existing data communications infrastructure. The 2345 transports any B3ZS coded, framed data stream and provides a transparent link extension when transporting C-bit Parity and M13 framed signals. 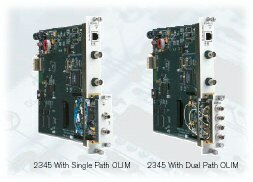 It is available as a standalone and as a rack-mount card with modular, hot-swappable, and interchangeable Optical Line Interface Modules (OLIM). 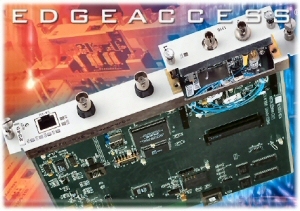 The rack-mounted card is part of the Universal Chassis System (UCS). SNMP support is available for both the rack-mount and the standalone versions with end-to-end monitoring and configuration facilitated via the Side-band Management Channel. The network manager can gather statistics and link information from the remote end. Software upgrades can be downloaded remotely. To reduce critical circuit downtime, fiber path and full hardware modem redundancy options are available. 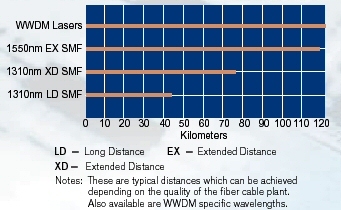 In each option, failure in the primary causes an automatic switchover to the secondary fiber link. The 2345 is ideal for extending T3 from the telco demarcation point and WAN, as well as extending interconnection between T3 multiplexers. For applications that require multiple modems, refer to the Universal Chassis System (UCS) data sheet. 90 to 275VAC, 47 to 63Hz Auto-ranging, 10W Max. 38 to 72VDC, 9.1W Max.